NEAT Receipts Scanalizer consists of a compact, lightweight scanner, software to organize your digital images, a USB cable, and accessories for travel and desktop storage. Use the NEAT Receipts scanner and software to scan and store images and details of receipts, business cards and any paper documentation up to 8-1/2 inches wide. Scan a receipt and the software pulls the transaction date, amount and sales tax into the software, then categorize the transaction and can indicate if the receipt is reimbursable or tax deductible. Scanned items are organized into folders with separate organizers for receipts, tax-related documentation, business cards, and documents. Receipts can be printed, emailed or exported to a variety of formats including PDF, OFX, and QIF. Keep paper documentation organized in one place. Reduce the amount of paper you need to keep physically organized into files - or piles. Export receipt data to Microsoft Money, TurboTax, Microsoft Money and any financial software that imports QIF files such as Moneydance, Quicken or You Need A Budget Pro. Export data for further analysis to Microsoft Excel. Receipts, contacts/business cards, and documents are managed in NEAT Receipts and can be exported to Quicken, Microsoft Money, QuickBooks, Microsoft Word and Excel and HTML and PDF formats. The Receipts Organizer is organized by folder types, such as business and personal, and by categories. Scan a receipt or a document up to 8-1/2 inches wide and NEAT Receipts saves an image of the item while the date, amount and other receipt details are recorded. The Tax Organizer offers 116 tax categories to assign to receipts and documents for convenient tax reporting. View income tax information or generate tax reports by Form 1040, tax schedules like Schedules A and E, and tax forms like Form 8829 or 8836. Tax-related data can be exported to TurboTax, Microsoft Excel, and other file types. Keep documents organized in descriptive folders in the Documents Organizer, which has a good search function for locating documents quickly. Examples of documents you might scan with NEAT Receipts include insurance policies, contracts, detailed receipts from charitable contributions, report cards and recipes cards. The Business Card Organizer extracts contact information from the scanned business card to populate contact information in the software, complete with a copy of the scanned card. To search through contacts, use the search function or click on A-Z tabs at the top of the contacts window. Contacts can be exported to or synchronized with Outlook and Plaxo. The compact size and 10.6-ounce weight of the NEAT Receipts Scanalizer scanner make it ideal for business travelers. The scanner takes up very little space on a desk, especially when stored in the desktop stand and connects to your computer with the USB cable, both of which are included with the scanner and software. Scan a receipt or a document up to 8-1/2 inches wide and NEAT Receipts saves an image of the item and extracts data to the software such as date, amount and sales tax. The scanner is capable of getting complete scans of unclear or crumpled receipts. The Adjust Image feature, available after scanning an image, works well to darken text on receipts if needed. Calibrating the scanner is a quick procedure accomplished by scanning the included paper with black markings. The software explains step-by-step how to calibrate, and it told me to insert the calibration sheet face-up, however, the scanner didn't calibrate after running the sheet through the scanner five times. I ran the calibration sheet face-down and finally achieved calibration. I don't know if there was an error in the directions or if I just lucked out on that last calibration scan, but I haven't had to recalibrate since and get consistently good scans. The NEAT Receipts scanner auto-sizes, auto-crops, and auto-rotates all scanned documents and receipts. Installing NEAT Receipts is easy. Just follow the direction and take any shortcuts during the NEAT Receipts installation to avoid potential hassles later on. Plug in the NEAT Receipts scanner, then specify whether you will use the scanner for personal use only (organizing personal and household expenses, manage tax deductible expenses, saving documents) or business use as well (organizing business expenses, creating expense reports). You can change this preference later in the software. NEAT Receipts gives you an opportunity to view a quick tutorial which explains the general use of the software, the scanner, and the receipts, tax reports, business cards and documents modules. The tutorial also explains how to how to calibrate the scanner using the calibration sheet. Each calibration of the NEAT Receipts scanner takes less than a minute, although multiple calibrations are sometimes required. If you lose included calibration sheet, you can print your own from within the Scanalizer software. Receipts, documents, and data scanned into NEAT Receipts can be saved as or exported to a number of formats, including those for Microsoft Excel, QuickBooks, Quicken, Microsoft Money, or any software that imports QIF, OFX, and CSV data formats. Exporting to PDF, HTML and Microsoft Word is straightforward, but before exporting to an Excel spreadsheet for the first time, you must map database fields between NEAT Receipts and the spreadsheet column headings. NEAT Receipts explains the procedure for doing this. If you will be importing your receipt data from NEAT Receipts to financial software, set up categories in NEAT Receipts that are identical to your financial software categories to avoid problems with budget and other financial reports. Exporting OFX data from NEAT Receipts to Microsoft Money is pretty straight forward, but if you use Quicken, keep in mind that it will only import QIF data into cash accounts. The NEAT Receipts documentation suggests holding transactions in the Quicken cash account, but this won't work well for those who have receipts from more than one account (which is just about every Quicken user). You will have to import the QIF transactions to the Quicken cash account, then move the transactions to the appropriate Quicken accounts. Quicken, Microsoft Money, and many other financial software titles utilize split transactions to divide a transaction into multiple categories. NEAT Receipts splits receipts into multiple categories, but does not display transaction splits the same way financial software does in the account register. Instead, one copy of the transaction shows up for each category. For example, if you bought dog food, ice cream and a roll of tape at one store and split the receipt into categories for pets, groceries and office supplies you would see the receipt listed three times with the same date and vendor, but different categories and dollar amounts. Split transactions import from NEAT Receipts into financial software with one transaction per category assigned in the split, which will be inconvenient for viewing in the register but will not compromise financial reporting. 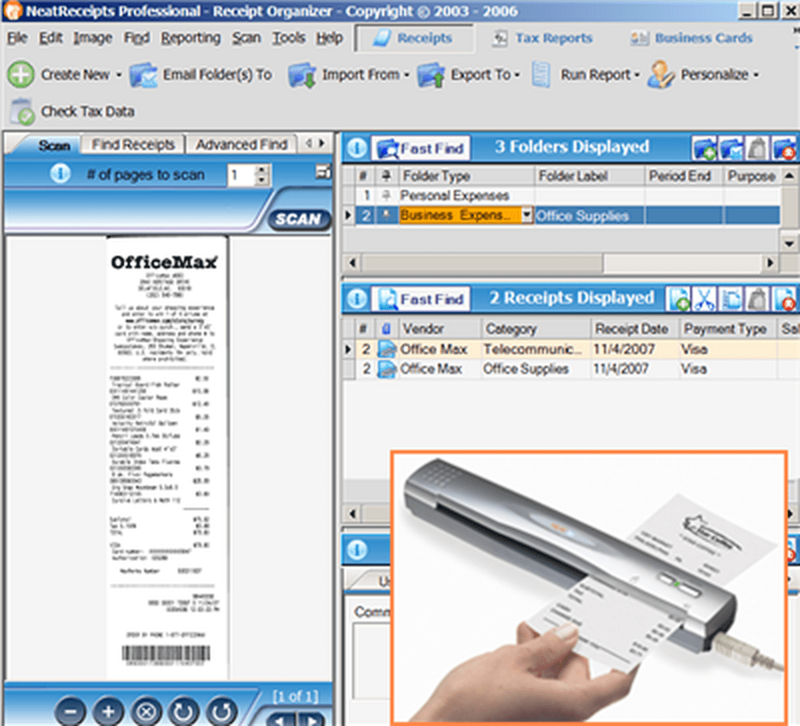 If you use Quicken or Microsoft Money and want to have all split transactions share the same appearance in your account registers, use traditional methods of entering transactions, then export receipts from NEAT Receipts to digital image files to be attached to transactions in Quicken (2007 and later) and Microsoft Money Plus(2008 and later). Click on Help in NEAT Receipts to see the Quick Start Guide and NEAT Receipts Help, both PDF documents and how-to manuals. Both of these references are a quick read that will have you using the software much sooner than learning as you go. You'll want to read Section 2 of the Help PDF to set up the software correctly, and you can the PDFs to your Windows desktop for easy reference while first learning how to use the software. Review: Should You Buy NEAT Receipts? Scan and automatically organize multiple documents at the same time. Scan to PDF and select and copy editable text from a PDF. Improved memory management, application performance, OCR and parsing accuracy. The latest NEAT Receipts version costs $39.95 and up, depending on the type of scanner ordered with the software. NEAT Receipts technical support answers questions quickly and thoroughly in the online support forums, and the tech support chat is a great real-time source for help. The software simplifies data entry and is perfect for business travelers and self-employed individuals who need receipts and expense data for tax reporting. NEAT Receipts is also useful for the home user who wants to store insurance policies, bank statements, bills and other documentation in addition to receipts. The only downside found was how NEAT Receipts exports split transactions and how Quicken users have to deal with more steps to import data into the appropriate account.